From Main body of report: The overman of the pit, an old experienced man, went with a naked light into a disused working containing gas. It would appear that he had just been discussing with his companion the propriety of having a safety lamp, when the gas exploded and burned them both. He died, his companion recovered. 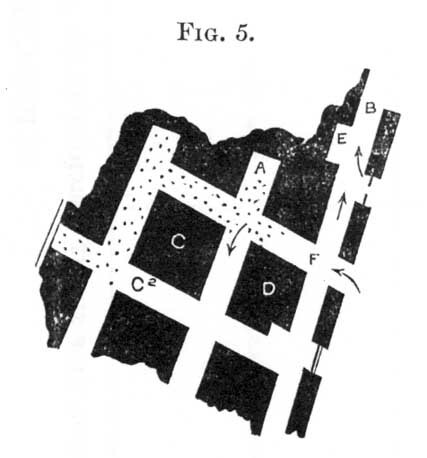 From Main body of report: From the evidence of the engineman, the cage in the "rise" side of the shaft, while being brought to the surface, caught against the guides, or wooden midwall, near to the pit mouth, when the cage got displaced, or driven out of the guides. From Main body of report: There were three seams of coal being worked at different levels, and hutches were placed upon the cages at these several landings. From the frequency of this description of accident in some parts of this district, attention has often been directed to the insecurity of the system. By the new Mines Regulation Act, General Rule 14, I trust that a complete stop will be put to this reckless and insecure system of working, or that something effective will be introduced, so as to render such accidents impossible. They are undoubtedly preventible, and should never take place. 1872 March 1 Gartshore, No 5 Kilsyth Wm Baird & Co Patrrick Lappins Collier 49 Explosion of fire damp. From Main body of report: Happened in a fiery pit, in one of the usual working places. It appears that the fireman on the morning of the accident reported the place clear of firedamp, and the person usually engaged in it, worked safely till 3 o'clock in the afternoon. It is a question whether the ventilation had not been partially checked by loose coals having been placed in the air course, as after the accident, the deceased's lamp was found hanging within a foot of the roof, near to the face, where it is assumed he had been working with it at the time of the explosion. The seam is unusually steep, and a slight check in the air course would be immediately followed by an accumulation of gas. 1872 April 13 Gadgirth No 1 Ayr Geo Taylor & Co John Welsh Fireman 40 Explosion of fire damp. From Main body of report: Happened to a fireman, who in the course of his examination went into a heading with his open light, and ignited a small quantity of gas, by which he was burned, and died from the effects. This is the old story, and it is difficult to conceive how an experienced workman should so far peril his life, when by using a safety lamp, which he had with him at the time, his examination could have been made with safety. The deceased was fireman, and at the time of the accident was engaged going his round of examination. The pit was not fiery, and it appears that the only fire-damp known to exist at the time did not extend to more than one or two places. The deceased had, in the course of his examinations, been in the habit of proceeding with his open light to within a certain distance of the places suspected to contain gas. And, as afterwards explained by himself, he had by some mistake on the morning of the accident gone beyond the point of safety. The reckless way in which examinations are made, has been so often the subject of comment, that it is scarcely necessary in this case to say more, than that it is another of the same. It is absurd to trust to a mine being free of gas, after a stoppage of 12 hours; and the fireman should proceed with his examination, on the assumption that any part of it may from circumstances not without the range of possibility, have suddenly become dangerous and unsafe. From Main body of report: A very unusual accident occurred at Cleland, whereby a man was killed by the cage on which he was ascending getting detached from the rope. It appears that the rope had been too long, and when the cage rested at the pit bottom the slack chain wound round the muzzle and bolt, and broke the "split locking," which kept the bolt in its place. By degrees the bolt worked out, and unfortunately about mid-day, when the deceased was ascending the shaft, it came out altogether, and the cage, with the deceased, fell to the bottom and he was killed. I think a nut with a pin through it, or the bolt screwed into the muzzle, is better than a split locking. 1872 June 6 Westmuir Shettleston Robt. Gray & Co James Russell Collier 18 Fall of roof at face. 1872 June 14 Twechar, No 1 Kilsyth Wm Baird & Co Daniel Ralston Miner 40 Fall of roof at face. From Main body of report: Caused by neglecting to brattice a room standing " up stoop." The deceased, a little boy, had either out of curiosity gone or been sent into the face of the room to "chap" or signal to a man who was driving an end over upon it, he went with his naked light and ignited some fire-damp lying there, which burned him so severely that he died a week or two afterwards. It was known to the overman and the fireman that gas had been standing in the place for some days before, but no attempt was made to ventilate or to prevent any one from getting into it. The overman and fireman were tried before Sheriff Spens and a jury for neglect of duty, and fined in five pounds each. 1872 July 18 Calder Bank No 1 Baillieston Provanhall Coal Co Adam Cook Drawer 13 Fall of roof at face. 1872 September 28 Calder Bank No 2 Baillieston Provanhall Coal Co Alex McGregor Drawer 18 Explosion of fire damp. From Main body of report: Calderbank No. 2, pit is 53 fathoms deep to the Pietshaw and main coal seams. Referring to the accompanying sketch, Fig. 5, which conveys an idea of the ventilating arrangements near to where the accident happened in the main coal seam, it appears that the " plane " A, to the left of the mine B, was at the time of the explosion, and for some days previous to it, filled with firedamp. Gas also extended sometimes down as far as the pillar C, and along the low side of A, to C2. At the time of the accident there were only two places being worked near to the firedamp, the pillar D, and the " end " E. The "end" was being driven over upon the plane A, for the purpose of forming a communication with it. I understand that the explosion took place at the opening F, and was occasioned by the gas at that point being ignited by John Allison's light, who worked at E, and who was passing with a loaded hutch at the time. The deceased worked at the pillar D ; he was injured by the explosion, and died from the effects of it. The provision in this case for the safety of the workmen was bad, and as might have been expected proved insufficient. The gas was known to exist as above explained, and though it had not been discovered as far out as the drawing road, where Allison had to pass with his loaded hutches at F, it must have been known to those in charge that any slight check upon the current of air passing inwards towards the " plane " A, for the air was split, would allow the gas to occupy a place farther out, or nearer Allison's drawing road. Of this unsatisfactory state of things the underground manager was well aware. He used no effective means for improvement, and took no precautionary steps, but imprudently authorised and allowed workmen to be employed in close proximity to the firedamp with open lights. He was charged by the Procurator Fiscal, Airdrie, with culpable neglect of duty, he pled not guilty, and was tried by the sheriff substitute of Airdrie, and a jury; after a lengthened trial, the verdict of the jury was given not proven. 1872 October 15 Coney Park Denny John Barr Alex Jaffray Collier 30 Fall of roof at face. From Main body of report: By the breakage of a round wire rope at Greenfield Colliery, Hamilton, three persons were killed. The men were ascending the shaft about 4 o'clock in the afternoon, and when near the surface the rope broke, and the cage on which they were ascending fell 100 fathoms to the bottom of the pit. They were all killed. The rope had drawn coals all day, and was not overloaded; it had not been in use 12 months, and had only raised 5,000 tons of coal. The pulley and drum were small (5 feet in diameter), but I could find nothing to account for the sudden fracture. From Main body of report: The deceased was an underground workman, and had, I understand, arrived at the pithead shortly before the accident, for the purpose of commencing a night shift. He appears to have engaged in conversation with the pit-head man, near to the pit mouth, and, I believe, had arranged to descend by the cage, which was being drawn up at the time. Suddenly, and while the cage was in motion, he stepped forward to the side of the pit and looked over the guard or gate, and before the pit-head man had time to call out or warn him back, the cage raised the guard, and his head was caught between it, and the "beam" or "wall plate" on which the roof of the shed was partly supported. He was killed instantaneously. While these gates have been introduced for the safety of the persons employed in and about mines, it would seem that they do not prevent altogether the possibility of an accident. It is of a kind, however, which should not in any way affect their being in general use, and a similar occurrence will probably not occur again. Note.The evidence in this case is voluminous, but the facts which the sheriff-substitute considers decisive of the question are not numerous, and may be said to lie on the surface. At the pit in question there was at the date of the accident a midworking and a lower-working. The same shaft communicated with both, and it was the duty of the defenders, the owners of the pit, to take sufficient precautions that those employed at the midworking should, when bringing their hutches to the cage, be protected against the risk of falling down the shaft. Patrick Gunn, the deceased, a lad of nineteen years of age, and son of the pursuer, was a miner working at the midworking, and on the day in question he, with his hutch, was precipitated down the shaft, and killed on the spot. The question to be determined is, did this take place in consequence of the fault of the defenders? Was it a damnum fatale for which no one was answerable ? Was it attributable to the fault of a collaborateur? Or was there contributory negligence ? The defenders were bound to take all proper precautions, the best known, and if they did this they would be sufficiently exonerated whatever might eventuate. Now, it is in evidence that there were various means to which they could have resorted, any one of which, whatever might be its disadvantages, would have prevented the accident in question. They might have placed a screen or scaffolding, or even logs;across the pitmouth. at the said midworking, and any one of these contrivances would have rendered falling down the shaft a physical impossibility (see evidence). They might have resorted to a system of blocks and self-acting apparatus which would also, so far as can be seen, have given absolute protection against such an accident taking place (see evidence and model). The defenders did not adopt any of these methods for reasons that will afterwards be noticed, but betook themselves to a method known as that by a trapdoor and bottomer, a method which is perfectly safe, provided the principal part of the mechanism, viz., the bottomer, is fit for and does his duty. According to this system a door is placed in the workings some yards from the open shaft, and is made to open inwards towards the workings. When this door is shut if is physically impossible that either hutch or man can get into the shaft. It is therefore the duty of the bottomer to keep it always shut, except when the cage is down, and a hutch is coming to or leaving the cage. If the bottomer attends to his duty and works this door properly, no accident can occur of the kind in question, because no hutch can pass unless when the pitmouth is closed by the cage. It thus becomes evident that all depends in this method on the bottomer being a man in every way fit for his important duties. The defenders were not bound to adopt this method, for there were many others. They did adopt it, however, and they were in consequence bound to see that the organ upon whose proper working its value for safety entirely depended was sufficient; in other words, that the bottomer was fit for his duty, and if they failed in this, they can no more shelter themselves under the doctrine of collaborateur than if they had failed in providing a sufficient door. Now, in the present case, notwithstanding the adoption of the system of trapdoor and bottomer, the late Patrick Gunn, with his hutch, fell down the shaft and was killed. This of itself indicates something wrong with the apparatus, because if the door were shut and were sufficient such a thing could not have happened. That the door was sufficient there was no doubt, it is abundantly proved by the defenders. That the door was open at the time when it should have been shut is proved as distinctly as any fact is the case. Where, then, was the fault ? Not in the inanimate part of the mechanism, but in the bottomer who failed in his duty, but who was just as much a part of the machine intended for the safety of the workmen as was the door itself. Now that the bottomer was totally unfit for his duty, and that the defenders must be held to have known that is patent all over the evidence. He was an old man who had met with a serious accident that seriously affected his motive powers. In no sense could he be called active or intelligent. A host of witnesses speak to this. Even those who speak of him as fit enough for the work are beaten from this in cross-examination. The very appearance of the man at the proof left no doubt of this in the mind of the sheriff-substitute. Indeed, a perusal of his evidence will go far to show that the injuries he has received have not affected his physical powers only. It may be asked why the defenders chose the plan of trapdoor and bottomer in preference to all the other modes which were at their service. The reason is very obvious and fully brought out in the proof. Scaffolding in all its forms interfered with the rapid working of the pit, and might have seriously affected the out-put, self-acting apparatus was objectionable for the same reason. You could not use it if you required the hutches to ascend and descend at twenty miles an hour (see evidence). All these contrivances by which perfect safety from the risk of such an accident as occurred would have been secured were rejected by the defenders in favour of a method which was more conducive to their own interests. Surely in such a case they were bound to see that that method was properly carried out. In such a case as this, it is plain that the pleas of damnum fatale and collaborateur are entirely excluded by the facts. But it was argued strongly that here was a case of contributory negligence. The sheriff-substitute is unable to adopt this view. There is no evidence to show that the deceased was in fault at all. The only man who seems to indicate such a thing is the bottomer, McGuire. For many reasons the sheriff-substitute attaches no weight to his evidence. Indeed, a mere perusal of his deposition, without the advantage of seeing him, will satisfy most minds that he is not reliable, and this becomes very certain when what he states is compared with Clark's deposition. The amount of damage has been calculated with reference to the actual loss by the death of the pursuer's son and also with reference to the injury done to the feelings of the pursuer. £120 in that view seems a fair and moderate sum. From Main body of report: The deceased in this case were sinkers, and the pit in which they were employed was about 90 fathoms deep. The sinking was being made in whin, and the midwall, or partition in the shaft could not practically be maintained nearer than 10 fathoms from the bottom. The accident happened when the deceased were ascending the shaft, after having completed their preparations for firing two shots, and was apparently occasioned by the kettle in which they were being raised getting entangled with the midwall and capsizing, about 10 fathoms from the bottom. If not fatally injured by the fall they must have suffered from the effects of the blasting, for both shots went off. When recovered one was found to be dead, but his companion lived for two hours. In all cases the midwall in a sinking pit must be a certain distance above the bottom, and sinkers have invariably to guide the kettle past it when being raised. In this case the idea is that the deceased's lights had gone out, and in the darkness they had failed to guide themselves and the kettle clear of the bottom of the midwall. From Main body of report: Caused by the neglect of the fireman to examine the deceased's working place before he commenced work. The deceased went in with his naked light and ignited some gas which had been lying at the face, which burned him. The fireman was charged before Sheriff Spens and a jury, with culpable negligence of duty. The jury returned a verdict of guilty, and the sheriff sentenced him to three months imprisonment, observing that the crime, involving as it did the sacrifice of one life, was one which it was impossible to allow the alternative of a fine, and the punishment would have been six months instead of three, if it had not been for the recommendation of the jury. 1872 December 18 Boutreehill, No 6 Irvine Boutreehill Coal Co Thos Howat Collier 26 Fall of roof at face.